Global ocean warming – never mind being washed away, it can kill you if you eat crabs. Dungeness and rock crabs in California have been found to contain toxic levels of an acid that can kill. The authorities in California are advising people to avoid consumption of crabs contaminated by a natural toxin that has spread throughout the marine ecosystem off the West Coast, killing sea mammals and poisoning various other species. Kathi A. Lefebvre, the lead research biologist at the Wildlife Algal Toxin Research and Response Network, said on Wednesday that her organization had examined about 250 animals stranded on the West Coast and had found domoic acid, a toxic chemical produced by a species of algae, in 36 animals of several species. “We’re seeing much higher contamination in the marine food web this year in this huge geographic expanse than in the past,” Ms. Lefebvre said. She said that the toxin had never before been found in animals stranded in Washington or Oregon, and that there were most likely greater numbers of contaminated marine mammals not being found by humans. The guilty algae’s growth has been exponential recently, largely because of record temperatures in the Pacific Ocean. Warm water causes the toxic algae to divide more rapidly and to outcompete other species in the water. The algae then becomes a more prominent element of local plankton, a kind of marine trail mix made up of tiny particles that various species of aquatic wildlife subsist on. The California Department of Public Health recently advised people to avoid consumption of certain species of crabs because of potential toxicity. Razor clam fisheries in Washington have been closed throughout the summer for the same reason. In a statement released on Tuesday, the California department said that “recent test results” indicated dangerous levels of domoic acid in Dungeness and rock crabs caught in California waters between Oregon and Santa Barbara, Calif.
Domoic acid is a naturally occurring toxin that in severe cases can cause excessive bronchial secretions, permanent loss of short-term memory, coma or death in humans, according to the California department’s statement. Milder cases can result in vomiting and diarrhea. Pseudo-nitzschia, the type of algae that produces the acid, is a single-celled organism consumed directly by marine wildlife like anchovies, sardines, krill and razor clams. Those species are then eaten by larger predators, and the acid makes its way up the marine food chain. This summer, the West Coast experienced the largest algal bloom that scientists have on record. Ms. Lefebvre said that though there was not a lot of monitoring for species that had consumed domoic acid in Alaska, it was likely that the blooms reached the Alaskan coast as well. Michael Parsons, a professor of marine science at Florida Gulf Coast University, said there were several hypotheses for why Pseudo-nitzschia produces acid. If acid secretion is meant to deter predators, it is clear that it is a failing strategy on the part of the algae. Ms. Lefebvre expressed concern that the acid poisoning of sea life would continue to spread. “My concern is that we’re going to see an increase in the number and geographic range of marine mammals being affected,” she said. Or in other words, global warming is killing the seas, and now it can kill you too. And that’s before we even return to the topic of ocean acidification and its affect on our food chain. Or how this news will affect commercial fishers, and restaurants. But don’t worry, everyone, go back to sleep, go back to sleeeeeeep …. There’s nothing to this global warming stuff … go to sleep. Go to sleeeeeep … Oh. 3 giant storms simultaneously roar in the Pacific. For the first time. Ever. Three storms have been found simultaneously belting their way through the Pacific Ocean for the first time in measured history. 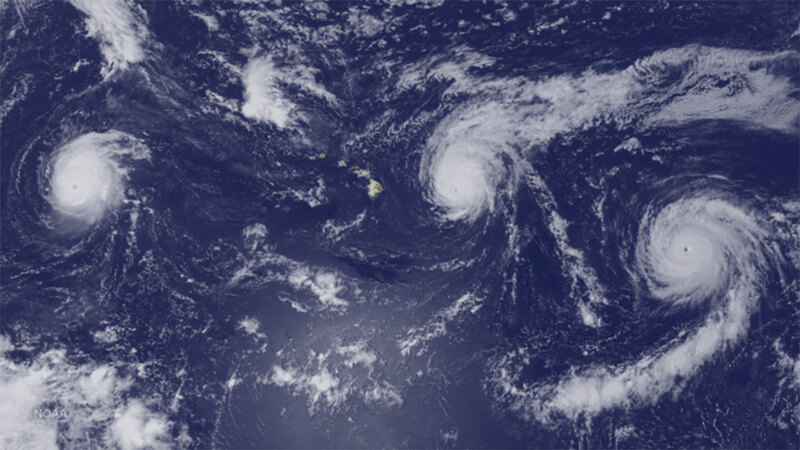 And although tropical storms Kilo, Ignacio and Jimena haven’t made landfall, they’re making part of the Pacific Ocean near Hawaii resemble a scary version of a Van Gogh painting. This is the first time three Category Four storms have been seen in the central and eastern Pacific Ocean at one time, according to The Weather Channel. Category Four hurricanes have wind speeds anywhere from 209 to 251km per hour. Hurricanes are categorised primarily by wind speeds: the higher the sustained wind speed, the stronger the hurricane. A Category One hurricane has winds up to 119 to 152km per hour, and the US National Oceanic and Atmospheric Administration says even those are typically expected to cause some damage to buildings as well as power outages for a few days. These aren’t Cat 1. They’re ALL Cat 4. A Category Four hurricane is considered catastrophic, with severe damage to buildings and power outages for weeks if not months. Climate Change Deniers like to find any random fact they can to debunk the reality of climate change. Why is a more complex question to answer, as they and their children are threatened just like everyone else. Recently they have taken to noting that the year 1934 was a very hot year in the United States, ranking fourth behind 2012, 2006, and 1998. Skeptics like to point to 1934 in the U.S. as proof that recent hot years are not unusual. However, this is yet another example of “cherry-picking” a single fact that supports a claim, while ignoring the rest of the data. Globally, the ten hottest years on record have all occurred since 1998, with 2005 and 2010 as the hottest. Remember, global warming takes into account temperatures over the entire planet. The U.S.’s land area accounts for only 2% of the earth’s total surface area. Despite the U.S.heat in 1934, the year was not so hot over the rest of the planet, and 1934 barely holds onto a place in the hottest 50 years in the global rankings – in fact it ranks 49th. The fact that there were hot years in some parts of the world in the past is not an argument against climate change. There will always be regional temperature variations as well as variations from year to year. These happened in the past, and they will continue. The problem with climate change is that on average, when looking at the entire world, the long term trend shows an unmistakable increase in global surface temperatures, in a way that is likely to dramatically alter the planet. The scientific community agrees (well over 95% agreement across a variety of scientific disciplines, not just climatology but also biology, oceanography, geology and so on – way in excess of the agreement we should need to feel “certain”) that humanity’s activity in the last 250 years or so has caused the planet to get hotter. Yes, the planet has warmed in the past, but never as fast, never as consistently, and never like this during the period of human civilisation. Global Warming causes Climate Change. Climate Change doesn’t mean everywhere will become warmer. It means some areas will be colder, some hotter, some wetter, some drier, some windier and some less windy. In addition, the seas will become more acidic, reducing biodiversity in the oceans, affecting the food chain, and threatening a widespread die off of species. This is just the latest example of “extreme weather events” becoming more common, emphasising the need for concerted international action to reduce greenhouse gas emissions from “dirty power” generation, heating, vehicles, farm animals, and industry. So what’s your latest head-in-the-sand response to these storms, Dear Climate Change Denier? Find a good list of climate myths debunked here. Try these the next time some idiot suggests you join them in avoiding the truth. Coal stinks. So what do you do if you don’t like the law being used to restrain you? Why, change the law, of course. Morwell Open Cut fire Sunday 14th Sept 2008 – just a few miles from Melbourne, and spreading pollution throughout the region, and drawing fire-fighting resources away from other areas where they were urgently needed. Enquiries are still determining the personal and environmental cost – and the hard cost – of the event. Coal mines are inherently unsafe, inherently polluting, as is the whole industry. So why should opposition to it be limited to people nearby? The Australian federal government have announced that they will repeal a section of environmental law that theoretically allows “activists” to stop major projects. The decision follows the Federal Court’s move to overturn approval of Indian mining giant Adani’s $16.5 billion Carmichael coal mine in central Queensland. “This government will repeal section 487.2 of the EPBC (Environment Protection and Biodiversity Conservation) Act which gives activists the standing to sabotage decisions,” Prime Minister Tony Abbott told parliament on Tuesday. The change was approved by federal cabinet on Monday night and went to the coalition party room on Tuesday. Despite widespread community reaction, it is expected to be introduced to parliament this week. It has been argued that the $20 billion investment in Carmichael could create 10,000 jobs, although estimates of jobs created in coal mines have previously been hugely over-estimated. Summarising the Liberal-National Coalition’s position, Attorney-General George Brandis said the laws as they stood allowed “radical green activists to engage in vigilante litigation” to stop important job-creating projects. Senator Brandis called on Labor to support the bill. In response, manager of opposition business Tony Burke urged the government to table legislation so Labor could scrutinise it. It will be interesting to watch and see if Labor just rolls over on this issue, again showing how close, in reality, the two major political parties in Australia really are. Phil Laird from the Lock the Gate Alliance said the law change would also ensure farmers could not challenge coal mine approvals. “The laws are there for a reason, to level the playing field between landholders and the community and the big mining companies,” he said in a statement. Liverpool Plains farmer Andrew Pursehouse said the government had now approved three open-cut mines on some of the best food-producing land in the country. “Now they want to limit who can go to court to challenge it,” he said. This proposed change to the law sets an ugly precedent and tells us a lot about the mentality of the Government. Why should environmental objections – or, indeed, any lawful legal objection to development – be limited to people in the immediate vicinity? For one thing, pollution is no respecter of artificially created legal boundaries. Water pollution can spread far from its original source, and once in the environment chemical pollutants can end up hundreds if not thousands of miles from the source. (Witness the radioactive material from Fukushima reaching the West Coast of the USA, for example.) Air pollution can spread over thousands of miles. And why would it only be the interests of those near the Great Barrier Reef, for example, if a development was proposed that threatened its existence or well-being? Or Kakadu? More and more, the Abbott Government acts like a petulant child every time it finds itself opposed. Abbott himself – and Brandis, amongst others – adopts a discordant, hectoring tone that is superior at best and utterly dismissive of any opposition to their whims at worst. This attitude is very unpopular with voters – rightly so – and is one of the main reasons the Government is so “on the nose”. As it stands, it is clearly un-electable again. That recognition is what’s feeding into renewed concerns about Abbott’s leadership, as swathes of anxious Liberal MPs face losing their seats if opinion polls stay anything like they are now. We have always said that having been near-mortally wounded in the first challenge to his leadership it has always been a matter of time before another came along. In our view, there is a strong argument that until “clean coal” technology actually eventuates – which it may never do – that the environmentally and socially-responsible thing for government’s worldwide to do is to slow-peddle on new coal developments. For one thing, they are likely to be only marginally profitable, hence the reluctance of many banks to get involved in financing them. This doesn’t deter coal companies from trying to establish new mines, of course. After all, they’re coal companies. It’s what they do. Turning around a company from its core purpose to do something else is so difficult that very few organisations ever even attempt it. That doesn’t mean the rest of us need to fall into line. Unsurprisingly, as it’s made from trees, Coal is the most carbon intensive fossil fuel. According to the United Nations Environment Program, coal emits around 1.7 times as much carbon per unit of energy when burned as does natural gas and 1.25 times as much as oil.According to the groundbreaking, peer-reviewed “Carbon Majors” study, tracing all historic greenhouse gas emissions back to specific companies and entities, the coal industries of the world own 51% of global greenhouse gas emissions from 1854-2010. Instead of fiddling with the law to remove legal protections put in place by their own Howard Government (how ironic) the Liberals and Nationals need to take a leadership role in moving away from coal as it’s default answer to energy, both here and overseas. As Greenpeace note: the world doesn’t need more coal, it needs an energy revolution. We have enough technically accessible renewable energy to meet current energy demands six times over. Our Energy [R]evolution blueprint shows how renewable energy, combined with greater energy efficiency, can cut global CO2 emissions by almost 50 percent, and deliver half the world’s energy needs by 2050. The case against coal is very strong. This American argument lays it out in terms anyone can understand. Yes, moving away from coal requires investment, political will, bi-partisanship and imagination. That doesn’t mean it can’t be done, no matter what coal industry lobbyists might say. Texas reels as climate change delivers ‘tsunami’ floods – the effects are becoming very obvious. Who is to blame, and what’s to be done? One of the effects of global warming resulting in climate change is that dry places may become drier – or ironically wetter – without warning, and to a greater degree. This will have effects on agricultural production, although ironically some areas (a minority compared to the whole) will be improved agricultural production due to either greater warmth or greater rainfall. But one of the most obvious impacts – and least talked about – is the effect of climate change on population, and specifically, on urbanisation. At its most simple, people worldwide need somewhere to live. And despite the desultory attempts of local and State governments to put them off – desultory according to the dominant belief system and political will in any given area – people still want to build homes on floodplains, near rivers, in wooded areas prone to bushfire, on beaches, and so on. Over the weekend just gone, sadly large areas of Texas focused on Austin felt the brunt of those decisions, and on the failure to contain temperature rise. This NY Times article (left) does an excellent job of both explaining the science, the politics, and the effect of the problem on ordinary citizens. We strongly recommend you read it. Just click the screen grab or click below. 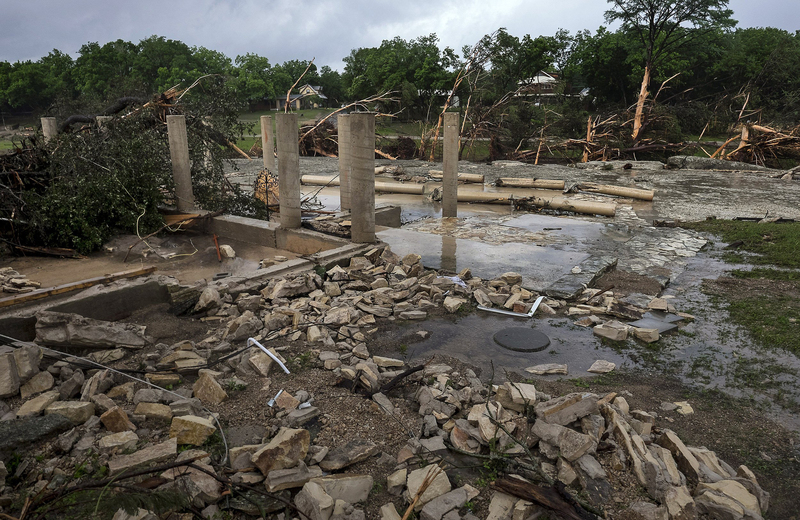 In Texas the race to develop outpaces flood risk studies and warming impacts. And this article, which we also suggest you read, gives a further scientific response to the contribution to climate change to the events of the last few days. We have no wish to ride this article on the backs of those enduring a distressing situation – none at all – but comment needs to be made, if for no other reason that the world is at a tipping point where further warming will simply increase the effects now being seen, but we still have time to take effective action to turn the tide back, if you’ll forgive the pun. We have dear friends in Texas, and we bitterly regret the growing number of deaths of those caught up in the flooding in that state, and those who have been injured or lost property. Our prayers and sympathies go out to those affected and if there’s a reconstruction or victim support fun we can be advised of, we will gladly donate to it. We have recent endured the same in Australia and the community effect is awful. Like Texas, with whom parts of Australia share similar climactic profiles, we have always endured droughts, fires and floods. But what is absolutely certain is that looking over the last decade or two such events are getting worse, and lasting longer. In order to ensure that remedial action is taken, we now need some clear, unambiguous thinking. It must be said that “deep south” Conservatives have led the way in pooh-poohing the reality of climate change, or its effect. For example, the absolute intellectual dishonesty of one Presidential candidate, Ted Cruz, on this issue, is skewered brilliantly in this analysis of his recent inflammatory, pseudo-science comments. Perry, along with energy companies, industry front groups, and other conservative politicians, sued the EPA in an attempt to block the agency from regulating climate pollution. Their argument was that climate science is a hoax. Under Perry, Texas led the nation in carbon emissions and is home to five of the ten worst mercury emitting power plants in the country. Against this nonsense, a detailed examination of the impact of likely climate change on Texas can be found here, from the University in Austin, the city in which great swathes are now under water. It’s cold comfort to those who were hit by “a tsunami” of water according to the current Governor that some in the political establishment in Texas are cheerleaders in refusing to tackle climate change despite evidence like this being freely available. For the record, we acknowledge there is debate over the scale of man’s contribution to climate change. But to pretend it is none whatsoever is clearly ostrich-head-in-sand-like stubbornness, mindlessly disputing the opinions of tens of thousands of well-credentialled scientists across a vast range of disciplines, not just climatology. We acknowledge that argument exists about the likely pace of climate change and the effects thereof. However: that there will be SOME change is undisputed, and even very small changes at the lower end of predictions are already having a profound effect on global weather, and the human population. Many of the effects of global warming – such as ocean acidification – are just as serious as weather change, and constantly ignored by the climate change deniers. These changes could see the world’s entire food chain threatened and the extinction of thousands of ocean species, both vegetable and animal. Given the foregoing, we should be taking PRECAUTIONARY climate change action. Even if it turns out that our fears are over-complicated or overblown, to ignore the current signs is moronic, dangerous, and surely equivalent to dereliction of dutyfrom our legislators. Politics has overtaken commonsense prophylactic government action, and that should be totally unacceptable to all. An understanding that we need to be CAREFUL while we sort out the science still further is one that should be shared by all politicians, of all parties, on a non-partisan basis. To reduce the matter to a political football (presumably based on a belief that it will enhance election prospects) is stupidity of a near-criminal nature. Is this really the best future mankind can hope for? Because you know what, Dear Reader? If we take action to combat climate change, and it turns out we were worrying completely unnecessarily, all we will have done is created a cleaner, less polluted planet. And old, dangerous and polluting industries will have been replaced by others. And who would mourn that? Let us hope those now struggling with floods and storms in Texas remember who refused to do anything about the problem before it came to this – and who they want in charge of their lives in future. We are, in general, wary of politically-active actors or musicians. Too often the luvvies are just promoting themselves via the causes they’ve latched onto, and achieving some spurious cachet while doing so. There are honourable exceptions of course: George Clooney on Somalia, Angelina Jolie on breast cancer and poverty, and Bob Geldof, Midge Ure and Bono on poverty. There will be others. And now we have Leonardo Di Caprio on climate change. And he nailed it. This short and poignant speech should be played to every politician and climate change denier on the planet. Please share this post widely and share the speech. Nothing else – nothing else – is acceptable. We cannot and must bequeath this crisis to our children. Well done Leo. Wot he said. With a wrecked ecology we will have no economy worth speaking of. While the world agonises over IS and other terror threats, THIS is a real, immediate existentialist crisis. *Australia’s Liberal-National Government (read: Conservative) have just scrapped the carbon emissions trading scheme and reduced investment in “green” technologies.